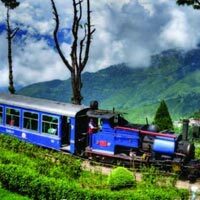 NJP to Darjeeling, Darjeeling sightseeing, Darjeeling to Gangtok, Gangtok sightseeing, NJP Drop.Air Fare/Train fare. Arrival at NJP at transfer from NJP to Darjeeling. Night stay in DARJEELING. Gangtok sightseeing. Excursion trip of Tsomgo Lake from Gangtok city. Tsomgo Lake freezes completely during the winter and is much revered by the locals. Rumtek Monastery, Institute of Tibetology (closed on Sunday), Dro-dul-Chorten, Flower Exhibition centre, Directorate of Handicraft & Handloom.